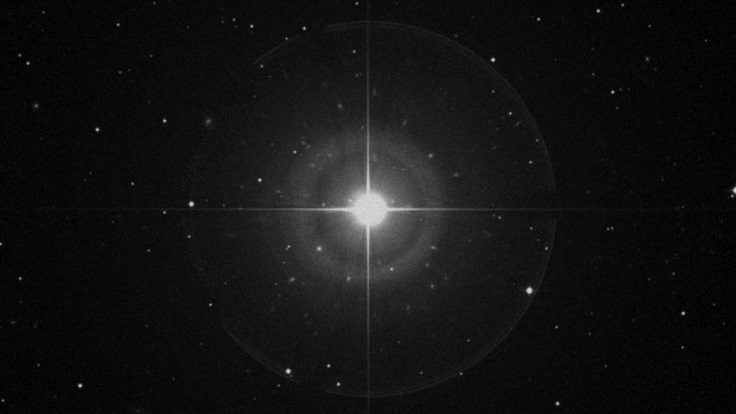 Fixed star Al Pherg , Eta Piscium, is a 3.6 magnitude star near the tail of the Northern Fish of Pisces constellation. Even though a dim star it is still the brightest star in the constellation. The ancient Babylonian name for this star is Kullat Nūnu, with Nūnu meaning Fish and Kullat referring to either a bucket or the cord that ties the fish together.” The traditional name Al Pherg is from the Arabic تدفق المياه (Al Fargh) which means an outpouring of water. 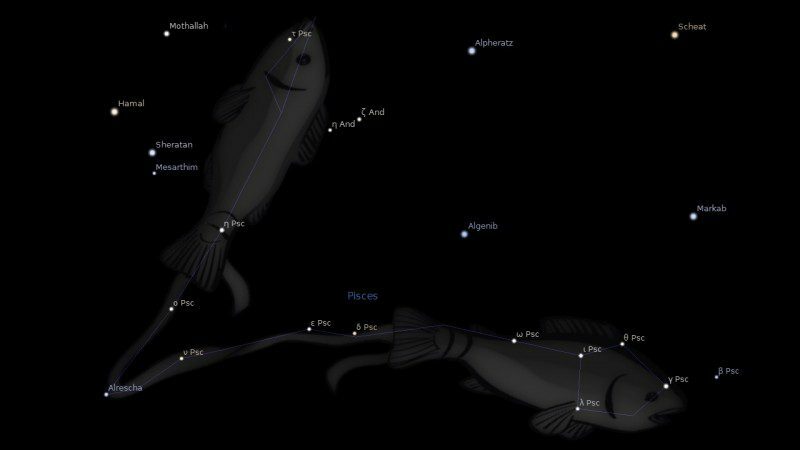 Kullat Nuni or Al Pherg is the only star in constellation Pisces that is used in fixed stars astrology. It lies in the shorter, northward running arm of the string. It crossed the vernal point (0° Aries) in 1846, the same year that the planet Neptune was discovered. The origin of the Babylonian name Kullat Nuni is a little obscure now, but was long thought to be, again, ‘Cord of the Fish’. There is good reason, however, to interpret this as ‘Home of the Fish’. This brings to mind the Sagittarian star Nunki (Pelagus), the ‘Voice of the Sea’, symbolizing the guidance which directed the early survivors of the Great Disaster to make landfall and a new civilization in the region later to become Babylon. So the ‘Voice’ and the ‘Home’ of the ‘Fish’, those who came from the sea, have much more in common than the mild similarity of the names Nunki and Nuni. It is further significance that the astrological Fishes themselves, both in and out of the Zodiac Signs, are known specifically by the stars in their mouths, Fomalsamakah and Fomalhaut, in other words by their voices. Kullat Nuni’s later name, Al Pherg, is of course Arabic, properly Al Fargh. The term means an outpouring of water, and the mouth or lip of any vessel used for water (or anything else). So there is the connotation of, again, something coming out of its container onto the earth and for the use of Man. Water inside a vessel is very much a hidden thing; we don’t even know for sure that it is water until it is poured and tasted. Folklore abounds, of course, with tales of wine and water interchanging by magic within the flask, or emerging poisoned, or as the fire-creature the Jinn (or Genie) when Al Fargh is uncorked. 1. Fixed Stars and Judicial Astrology, George Noonan, 1990, p.40. 2. Fixed Stars and Constellations in Astrology, Vivian E. Robson, 1923, p.134. 3. The Living Stars, Dr. Eric Morse, 1988, p.117. 4. The Fixed Star Health and Behavior Imbalance, Ted George and Barbara Parker, 1985, p.13. What about conjunct Jupiter? Thx. If there is nothing mentioned for your planet in any of these fixed stars pages then see the general interpretation. As I add more famous people we should get some idea. All I have found so far for Jupiter is Rihanna. My Mid heaven is 26 degree Aries, with Moon/Mercury conjunct the mid heaven in the 9th my Sun is in the Tenth. I can certainly agree with this fixed stars influence in my life. so ,i guess this star sits right on my 25-26 degree aries ascendant ? and my 26 degree “part of fortune ” ? Where i live, Al Pherg is on the ASC at the 24 Sept 2018 Full Moon. What will be,will be? Any Shamballic mysteries to be revealed? Good ones I hope. But that might depend on how it aspects your chart. Born on a new moon.